As with the contemporary workAufsteig, Kandinsky is again playing whimsically with geometric forms in this work. In this year he was to write, 'I do not choose form consciously, it chooses itself in me.' The work consists of a semicircle finely but precariously balanced on the tip of o triangle, It is counterbalanced by a narrow rectangular strip and smaller orange segment, which, although smaller in area, between them seem to balance the semicircle perfectly. To achieve this perfect balance Kandinsky uses a careful blend of colours that increases the apparent density of the smaller segment. The fact that it overhangs the semicircle both checks and extends its vertical progress; hence the title. A horizontal line that further bisects the semicircle draws our attention to its central axis, and its tension with the vertical that maintains the balance. 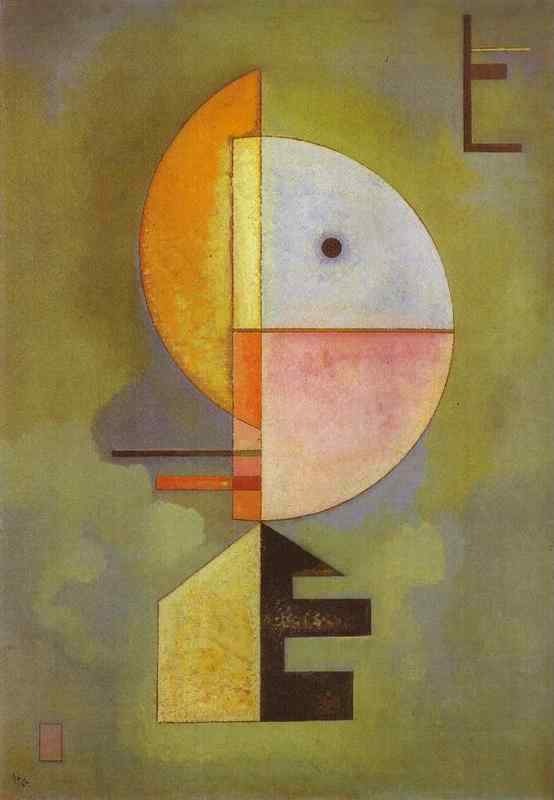 By this Kandinsky achieves both a tension and a synthesis in the work. There is also a sense of a human face in this work, the 'heavenly' blue circle and aura depicting the eye and the narrow red rectangle representing a mouth, reminiscent of an earlier work by Paul Klee.